Indoor marijuana growers face a unique dilemma when deciding how to grow their crop: should they grow in soil or in a hydroponics system? If you haven’t before considered a hydroponics system and you have a larger budget, you may want to look into it. Many growers opt for soil when they are starting out. This is a good way to get to know the plant and how it functions, without over-investing in the process. You can grow a fully biological product, and you get to take advantage of all the agricultural knowledge humans have accumulated over the last several thousand years. Pretty neat, right? Out in the wild, the roots of the Cannabis plant will stretch out long distances over time, seeking water and the nutrients required to thrive. Indoor growing, however, requires a much smaller root system for both convenience and simple space required. It’s up to the grower to make sure the plant is being supplied with adequate amounts of water and nutrients. They just don’t have the space for expanding their root systems. Be sure that the temperature around the roots is warm enough (~68 degrees F), that the roots are well aerated, and that the water is being cycled and drained regularly so that it won’t become stagnant. It’s easier to irrigate plants in soil, or more forgiving at least. You don’t need to be quite as careful as you do when watering plants in hydroponics systems. Plus, the fertilization is easier to deal with in soil. It’s conventional, and so you can draw on a huge knowledge base. If you’re having issues, you’ll be able to troubleshoot them reliably. Different soils can also impart enjoyable and unique flavors to your harvest, which can frequently be a huge plus (although not necessarily). Unfortunately, dirt is heavy, and it takes up a lot of space. This is a problem for a lot of indoor growers who only have limited space. Plus, dirt is, well, dirty. Your chances of getting insects or pests goes up substantially when you use a soil substrate for your Cannabis plants. The factare, some people just aren’t gardeners. There’s a certain sensibility that goes into planting seeds in soil and coaxing the up into beautiful towering plants. If soil isn’t working for you, consider the finely tuned science of hydroponics systems. The size of your Cannabis plant will correlate directly to the size of its root system. This means that the more space your plant has to expand its roots, the more easily it will grow. If the Cannabis plant ends up being too large for the pot, you will run into issues with nutrient and water absorption. Your plant will have a minimized efficiency, and the soil will likely burn through water quickly. In general, if you have an average Cannabis cutting or seedling, a pot with dimensions of roughly 10x10x10 cm will be large enough for you. If the plant has reached the height of 25-35 cm (especially if it hasn’t stopped growing), you’ll need a pot that’s roughly twice as large, around 15x15x20 cm. If your plant grows larger than 80 cm, you’re going to need a pot that holds at least 10-12 liters. Once the plants reach any size larger than a meter, the size of the pot increases accordingly. Repot the plant when necessary (and carefully) as it matures. Remember to keep an eye on the plant as it grows. If your plant never has room to get bigger, it never will. 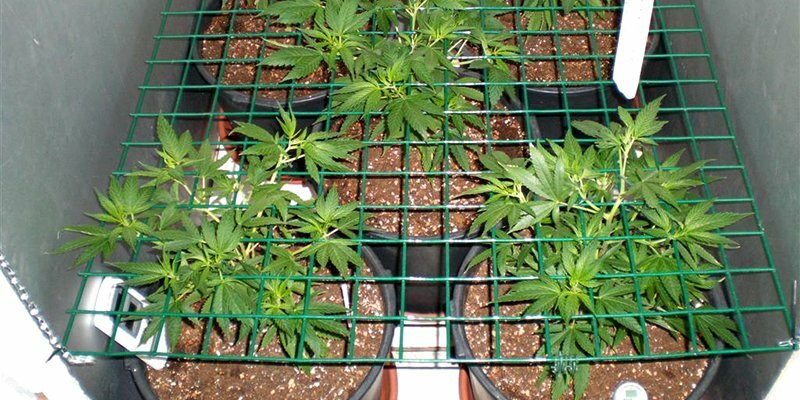 Check this link for the best pots to grow marijuana. Soil contains a wide range of naturally occurring ingredients because of its organic composition. A lot of the nutrients available in rotting vegetable matter and animal remains right away, however, requiring additional processes to break them down before they can be absorbed by the roots. Worms and insects aid in the decomposition process, breaking down the materials into a smaller form that the plants can absorb. Rain also helps in the decomposition process. Water is a very effective solvent; it can dissolve materials and make them available for absorption. Unfortunately, all of these natural processes can be difficult to duplicate for indoor growers. The best bet is to start out with nutrient rich soil and to make sure the soil has been sterilized before you begin potting your plants. Sterilizing your soil with heat won’t guarantee that you’ve killed every possible parasite and disease, but it’s an important preventative step. All it takes is one nasty parasite to spread around and ruin your entire crop. You can purchase a potting soil mix at a garden shop or mix your own. In either case, you’ll want to create an environment with plenty of oxygen, a temperature around ~20 degrees C, adequate water (moist but not wet), a pH value of 5.8-6.5, and plenty of nutrients. Read the article “Measure pH and TDS of your soil” and learn how to measure the pH and TDS of your soil. If you’re growing indoors, be careful to meet all the requirements of the soil. The acidity, humidity, and nutrients available in an environment will determine a great deal when it comes to your plants success. A proper pH value in your soil will maximize the absorption of nutrients. You can use chalk and Epsom salts to change the pH of your soil. Or you can buy pH-up and pH down at this link here. Water retention is also very important in your soil: if your soil drains water without retaining it, your plant will get thirsty fast. If there’s too much water, fungus could grow in the soil and damage the roots. 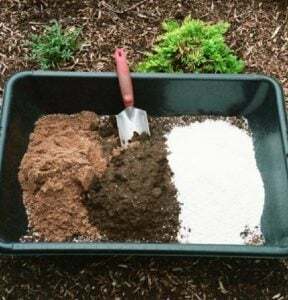 Consider modifying your soil with vermiculite, sphagnum moss, turf, or perlite if you want to change how your soil retains and drains water. You’ll also want to make sure you have the right amount of nutrients. Lots of nitrogen, a moderate amount of potassium and phosphor. One of the nicest things about soil is that you don’t need to be an expert to mix your own. It’s pretty simple, as long as you follow some basic rules about ratios. The sort of soil you want will vary depending on the stage of growth your plant is experiencing. For example, during the early phase of growth, you’ll want a soil mix made up of equal parts turf, perlite, and worm meal. For growth and flowering periods, use equal parts turf, worm meal, and compost. 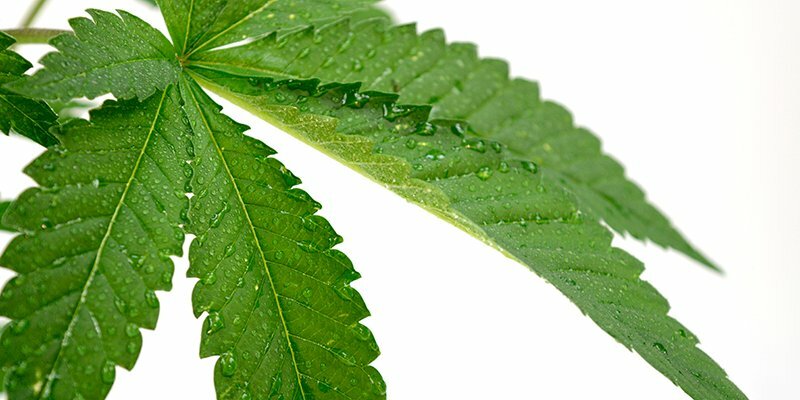 There are no hard and fast rules when it comes to watering a marijuana plant since the requirements of the plant are determined by the environment it’s growing in. If the environment is very hot, the plant will use more water. If the plant is receiving the maximum nutrients, it can absorb. Water acts a vehicle for dissolved nutrients and minerals, being absorbed through the roots before spreading through the rest of the plant. It also cools a plant down, fills up cells to keep the plant structurally sound, and is required for photosynthesis. In general, water enough so that your soil is faintly moist, but not wet. If the soil is too wet, you risk fungal growth and root damage. Hi Flint, Thank you so much for sharing. We are really happy to be of any help. Let us know if you have any questions. I've got two flowered plants and it seems that they have slowed in growing does this happen at the end of the life term of the plant? Thank you for the lesson .i would like to know the temperature for indoor growing ? Hi Darcy, I admit there are more than one way to grow our beloved plants. Maybe you could hop onto our support forum. Our experts there are happy to help you as are fellow growers. where do you get the light my windows are kind of high and no ledge how much light do they need do you buy special bulbs ? Starting out indoors with auto ww. I've never done either. Suggestions? Going to try my hand at an indoor grow using White Widow Auto. Can I Scrog or use LST to increase yields? Or should I just let it grow on its merry way? yOU SAID "equal parts turf".What is turf?